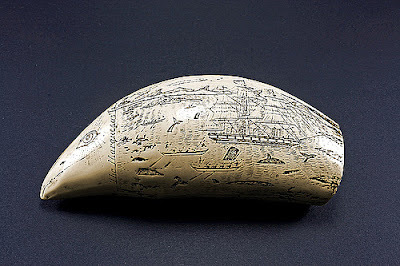 Scrimshaw – engraving on whales’ teeth, was an art born of loneliness onboard 19th century whaling ships, and has been an Azorean art since the seventies. In order to produce a scrimshaw work, the first step is to create a surface on which to work. The ridged tooth is sanded smooth and a polish is used to coat the tooth. A layer of India ink is applied and the surface to be engraved is now black. Delicate scratches are made, the needle cutting through the ink, the polish and into the tooth. The scratches then appear white. Ink is applied a second time and this time it enters the unwaxed scratches that form the image. The first coat of black ink is then removed. What remains is the fine, black engraving of the scrimshaw, a unique art form destined to be more valued as additions to the body of work become increasingly rare. The art form is disappearing because the supply of old teeth, dating from before the ban on whaling, is diminishing. Prices range between 50 and 1250 euros, but if you wish to take a similar though cheaper souvenir, you can also get works with engravings on bones, which are also typical of the islands. The Scrimshaw museum, located in Peter Café Sport, has a permanent exhibition of the best works ever made, making this a visit that you cannot miss. The works in fig pith consist of miniature sculptures produced from the raw pith extracted from November to February from the interior of the branches of adult fig trees. This is the period when the sap no longer rises, and the inner bark is white and dries within an hour in the sun. To execute this type of work, a variety of tools are used such as lenses, pincers, pocket knives, pins, compasses, rulers and sanders. The extracted fig pith is cut into small and very fine sheets and divided into fragments, which are put together with glue applied by the tip of a pin until the desired form is acquired. The glue used is gum arable that is very pure, and is prepared with water, which rests for two days and is then strained. It must then be kept out of the sunlight which makes it turn yellow. This type of work in fig pith is still one of the few traditional crafts of Faial today which is regularly practiced. The artifacts in fig pith probably came from the heart of the religious convents known in the city of Horta, that were active between the 16th and 19th centuries. Here, the tranquility would have provided the atmosphere necessary for such persistence and delicacy demanded by the fragility of the material. The pieces presented in the exhibition in the Horta Museum are by Euclides Silveira da Rosa, who was born on Faial Island in 1910 and died in São Paulo in Brazil in 1979. It was this artist who created the greatest variety of forms in this fragile material. He was certainly the most patient, capable craftsman, a technical perfectionist who was unequalled in sculpting fig pith. Other examples of typical handcrafts made in Faial, are the works using fish scales, the linen embroideries, and the straw hats, which can be found throughout the island. On the ground floor of the Capelinhos Museum, you can not only see an exhibition of such items and learn its history, but also see how they are manufactured live, and buy them as souvenirs.